Strictly Come Dancing star Russell Grant is returning to star in the West End after 34 years - to play a snake! 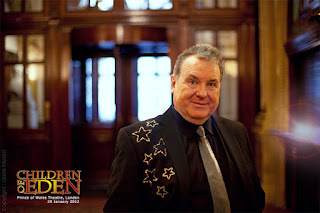 Russell will appear alongside Gareth Gates, Kerry Ellis, Oliver Thornton and Brenda Edwards in the Biblical-inspired musical Children of Eden, by Wicked composer Stephen Schwartz and John Caird, which is being revived in the West End for one night only in a spectacular star-studded charity gala at the Prince of Wales Theatre on Sunday 29 January. Russell Grant found international fame through becoming the Astrologer Royal but before Her Majesty, the late Queen Mother patronised him he had a very successful career in theatre, TV and film. His first role was for the very successful BBC TV’s Wednesday Play – he played a Welsh boy intent on arson! From here on to On The Buses, Please Sir!, The Fenn Street Gang, all the Doctor series starring both Barry Evans and Robin Nedwell. For over 10 years he appeared in classics such as Canterbury Tales for BBC TV starring Joss Ackland and Barbara Jefford and was in the first ever colour TV production the BBC’s Gazette. His first stage appearance was at the New Theatre Cardiff. He then appeared in stage tours of Ivor Novello’s King’s Rhapsody and Rodger and Hammerstein’s The King and I. He headed into the West End playing Slogger Williams with Chris Guard, Simon Le Bon and Keith Chegwin - at the time all unknowns - in the musical Tom Brown’s Schooldays. Other West End and National tour propductions included Camille (Arts Theatre): Hans Andersen (London Palladium); and Iolanthe. He was also one of the stars in the revival of Lupino Lane’s Me And My Gal at the Forum Theatre in Billingham before it transferred to the West End. During the period of astrological fame - nine years on BBC Breakfast Time and TV-AM - Russell appeared as Dame in many theatres, including the New Cardiff with Ruth Madoc, John Nettles and Andrew O’Connor, the Yvonne Arnaud, Guildford, and Blackpool Grand. Children of Eden will be performed by a company of 75, and will feature stars drawn from the West End and TV. The concert is being staged to raise awareness of the chronic and debilitating condition, Crohn’s disease and all proceeds will be donated to Crohn’s and Colitis UK. Children of Eden had its world premiere at the Prince Edward Theatre on January 8, 1991. It’s a joyous and inspirational musical about parents, children and faith. Freely based on the story of Genesis, Children of Eden is a frank, heartfelt and often humorous examination of the age-old conflict between parents and children. The show delivers a bittersweet but inspiring message: that the hardest part of love is letting go.